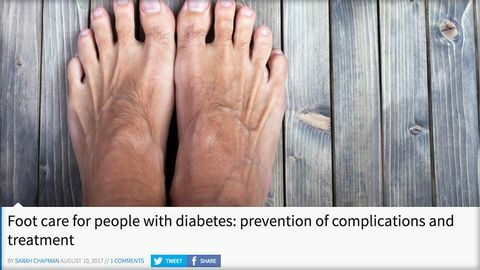 An article for nurses on footcare for people with Diabetes originally published in the British Journal of Community Nursing. Discusses various aspects of preventing and treating footcare issues in people with Diabetes from current evidence. Interesting discussion points with references. Article for Healthcare Professionals assessing evidence on best approches to prevention and treatment of foot complications. However useful also for patients to know that a multi-disciplinary and holistic approach is recognised as good practice to monitor the care they receive. Please note you need to log-in or register to post a comment or rate this resource. We try to ensure that all of the resources we feature are helpful and up to date, but we need YOUR help. If you have a problem with this resource, or the link doesn't work please let us know via email. The links and information on this website are provided in good faith, but should not be relied upon as medical advice. Please consult your doctor, clinic or healthcare professional before making any changes to your diabetes management. More.